The Golgi apparatus is formed from a pile of small sacs (rather like a pile of plates). This pile is called the dictyosome, and is single in animal cells but multiple in plant cells. The cis face of the Golgi apparatus which is found before the endoplasmic reticulum is distinguished from the trans face which is turned towards the cytoplasm. 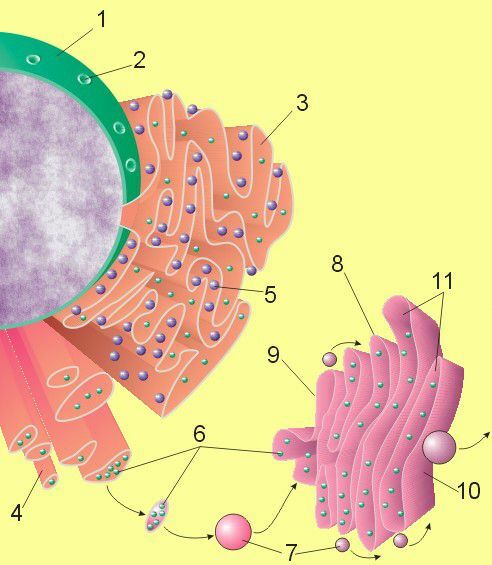 The main role of the Golgi apparatus is to act as a site of transport and as a reservoir for proteins and lipids produced in the endoplasmic reticulum. The apparatus is part of the internal membrane which eukaryotic cells have produced so that macromolecules can be transported. phosphorylation, or addition of phosphate. These changes make the proteins functional.